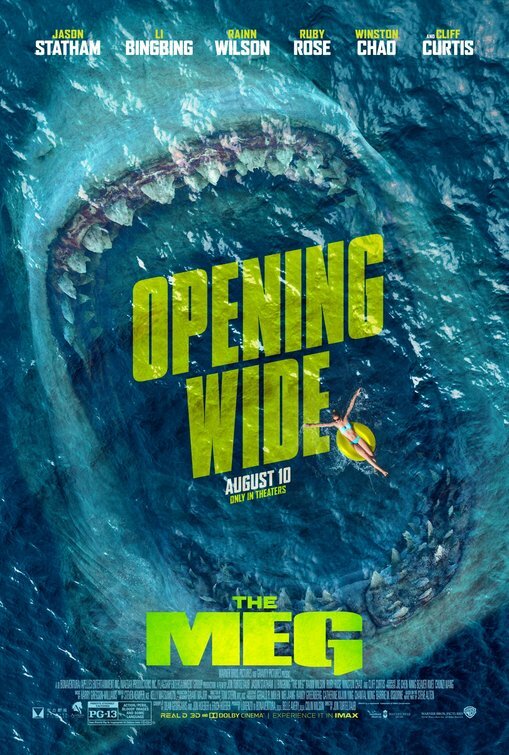 Dallas & Houston – see THE MEG starring Jason Statham on Tuesday, August 7th at 7pm FREE! Bigfanboy.com and Warner Bros. Pictures want you to see THE MEG starring Jason Statham, Li BingBing, Rainn Wilson, Ruby Rose, Winston Chao, Cliff Curtis, and Masi Oka at a special advance daytime screening in Dallas and Houston, TX. We want you and guest to see this one early and for free – the screening will be held on Tuesday – August 7th, 2018 at 7:00pm in Dallas and Houston. Each pass is good for two people (while supplies last). NO PURCHASE NECESSARY. One pass download per person. THESE PASSES ARE ONLY GOOD FOR DALLAS and HOUSTON! These passes are limited so print yours ASAP – once our allotment is used up for each location, that’s it. The screening in on Tuesday, August 7th at 7:00pm at the theaters specified on the pass – our pass codes are only good for the corresponding theater. One print off per person please, each pass admits two. Please, no trading of passes. If you’re not 100% sure you can attend, please do not print passes, as you could be taking a pass away from someone who genuinely wants to be there. These passes come to you compliments of Bigfanboy.com, and we frequently offer advance screening passes – please follow us ON TWITTER and ON FACEBOOK.